California’s Great America is a small amusement park and water park in Santa Clara, California. Our family, including my mother-in-law, visited California’s Great America on August 4, 2018. Here’s what families need to know before visiting California’s Great America. 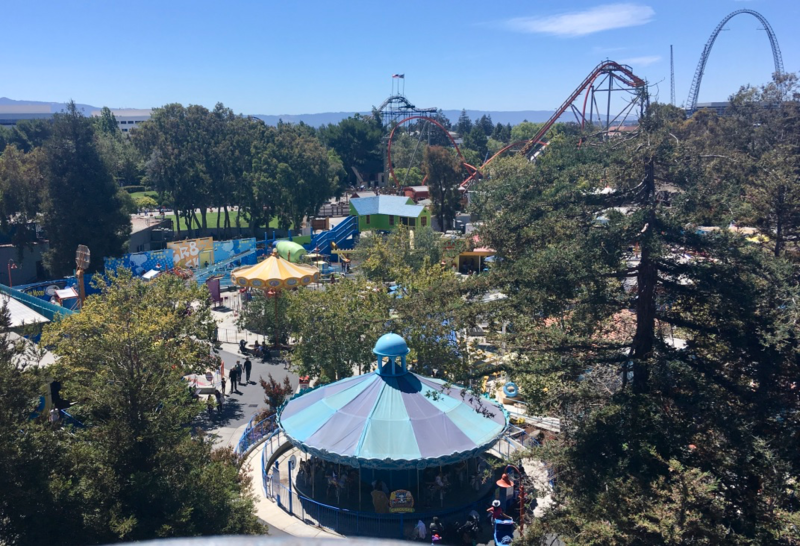 California’s Great America is located at 4701 Great America Parkway (Pkwy), Santa Clara, California, in the south part of the San Francisco Bay Area. It is right beside Levi’s Stadium, where the San Francisco 49’ers play, so traffic in the area will be rerouted whenever there is a Stadium event. To find out if there’s a Stadium event on the day you plan to visit, check here. For directions to Great America, click here. 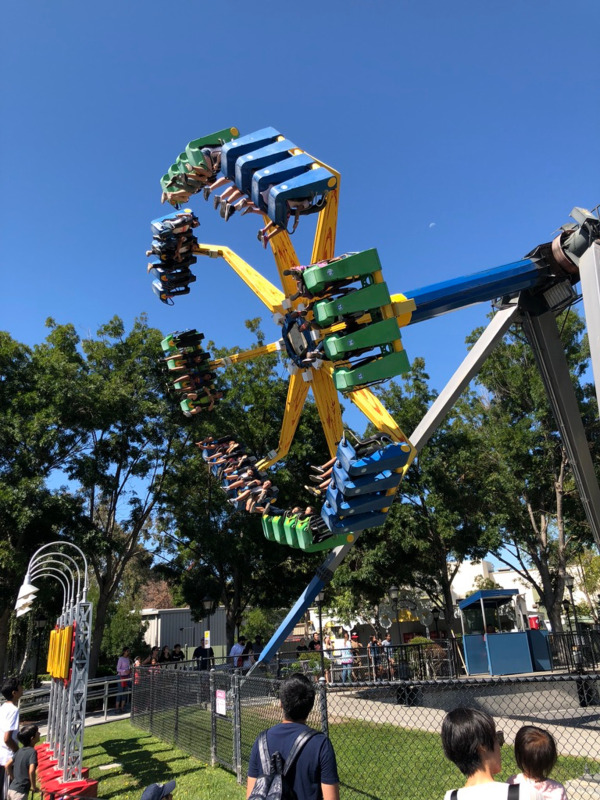 The Amusement Park part of Great America opens at 10AM on its operating days, but the closing time varies depending on the day of the week and the season. Some rides in the Park are open earlier for Seasons Pass holders. 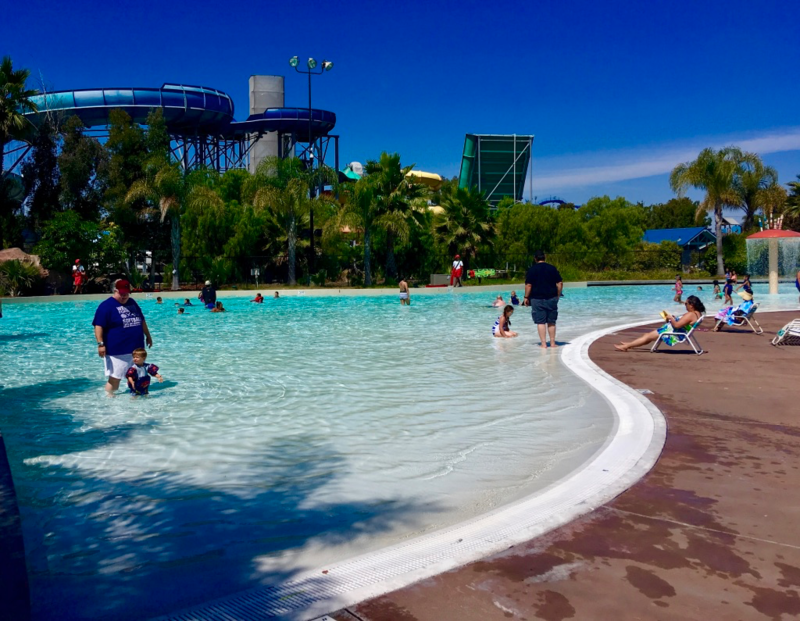 The Waterpark is open from 11AM-6PM on the days it is operating. After August 13, the Park and Waterpark will only be open on Saturdays and Sundays, except for holidays. Check the park calendar to find out park hours for the day you plan to visit. Waterpark hours are listed on a separate tab on the calendar. The earlier in the day you go, the less busy it is. Mom, don’t make us smile this early in the morning! Ticket prices for California’s Great America vary depending on the day and whether you want to add FastLane to you ticket. You can also purchase an all-inclusive ticket which includes the entrance fee, parking, all-day dining and some other perks. 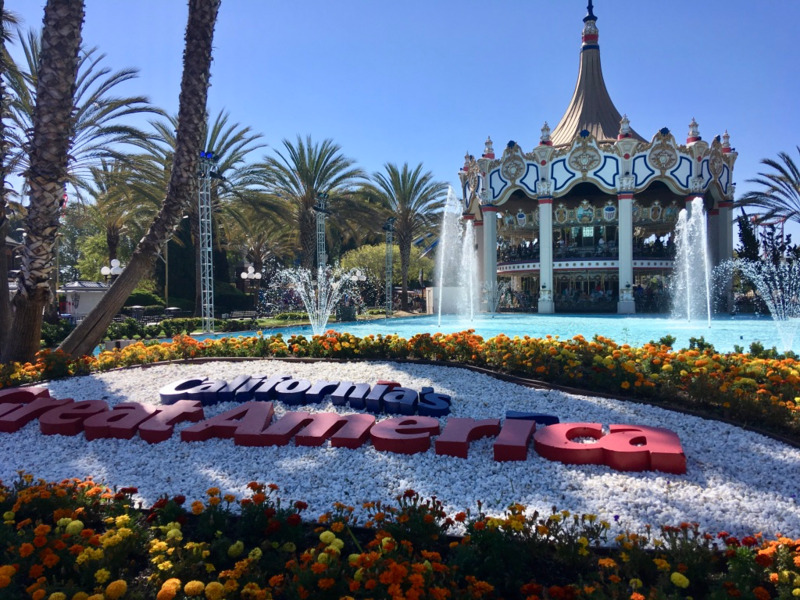 Check out Great America’s Tickets and Seasons Passes page for specific prices. Kids taller than 48″ pay the same price as adults. Children under 3 are free. Kids shorter than 48″ and Seniors ages 62+ pay a reduced fee ($6-$21 less per ticket). Weekdays are about $6 less than weekends, and if you enter after 4pm, everyone pays $36. Purchasing tickets at the gate is much more expensive than purchasing tickets on-line ($71 vs. $45 for an adult ticket). We bought our tickets through Groupon, so saved even more than purchasing from Great America online. Once you select your ticket, you can add FastLane, meal deals, parking and more. FastLane is available for 18 rides and attractions. My daughters are still a bit young for the thrill rides, so we did not purchase FastLane tickets. One FastLane ticket can add $57+ to the ticket price, so unless all you plan to do is ride the most popular roller-coaster, I would not purchase it. Parking is $20 online, $22 at the Gate, and $25 for a preferred parking spot. California’s Great America has stroller and wheelchair rentals. Strollers are $15 for a single, $18 for a double, plus a $5 deposit. Wheelchairs are $15 for a manual and $50 for an electric, plus a deposit. You can also rent lockers ($20-$30), and tubes ($5) for the wave pool. 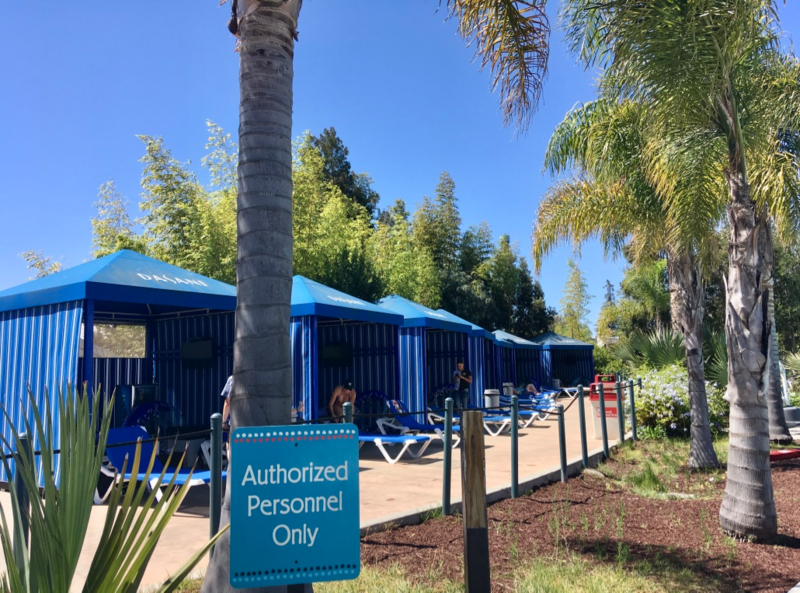 The waterpark has cabanas for rent in three different areas. The Wave Pool and Lagoon cabanas are for 6 people, and the Island Oasis Cabana is for 15 people. Prices vary, so check the Cabana page for prices on the day of your visit. It’s best to book Cabanas in advance, as they may be sold out if you try and book onsite. There are 10 restrooms and four gender neutral restrooms located throughout the park. 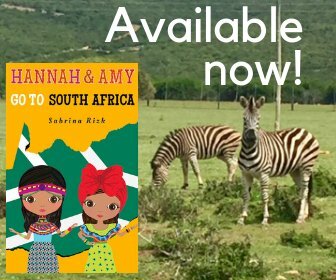 Guest services include an information center, first aid station, Family Care Center where lost children are taken, and a lost and found for lost items. ATMs, designated smoking areas, and a pet-relief area (for service-dogs) are also located throughout the park. In terms of shopping, there are a number of shopping areas throughout the park selling a range of items from t-shirts, to emoji pillows, to bubble blowers. Dundee’s Outback Outfitters, in Boomerang Bay has everything you need related to sun and water play, like towels, water shoes, and sunscreen. There are also a number of places to purchase ride photos. Like most amusement parks, you can have a caricature done of yourself, or get temporary tattoos or henna. My eldest daughter really liked her sparkly fairy tattoo (a nice change from face painting!). Like most amusement parks (except Disney), outside food is not permitted. There are about 10 different places to eat throughout Great America, from Subway, to pizza, to chicken tenders and hot dogs. 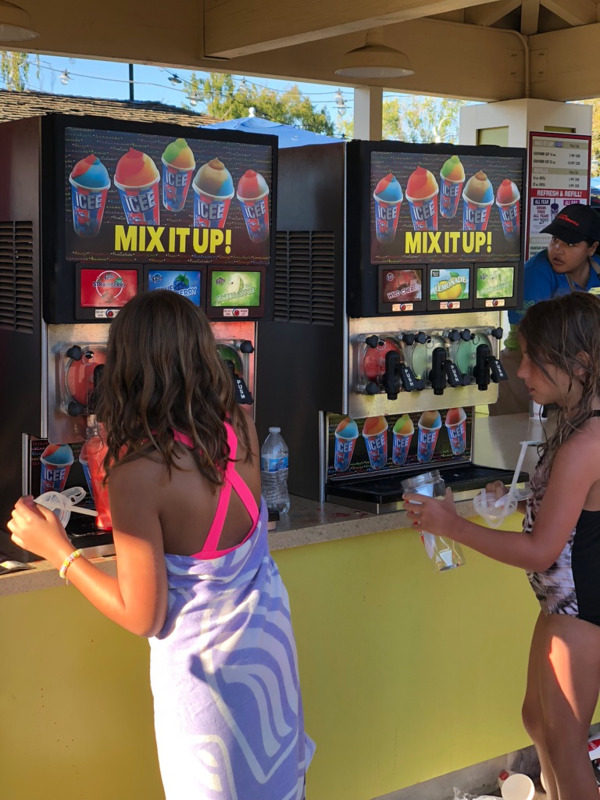 There are also a number of snack stands (popcorn, pretzels, churros, funnel cakes, and Dippin Dots) and Coca-Cola refreshments / Icee stands throughout the park. In general, prices for snacks and non-alcoholic drinks are in the $3.99-$5.99 range, and prices for meals are in the $7.99-$10.99 range. You can also purchase dining options in advance, from a single meal deal, including a drink, to an all-day or all-season dining plan, excluding a drink. You can also purchase drinks in souvenir cups in advance as well. See Great America’s Drinks and Dining page for more information, including information for those with dietary restrictions. Lastly, Great America has two picnic areas available for rent for Corporate Events. The day we went, Amazon was having an employee event. Great America’s Amusement Park has about 40 rides, including the newest roller coaster, Railblazer. It has a number of rides for all age groups, including 14 for younger kids, 13 for kids in the 6-11 range, 5 thrill rides (generally ones that spin around a lot), and 7 rollercoasters at various levels of intensity. 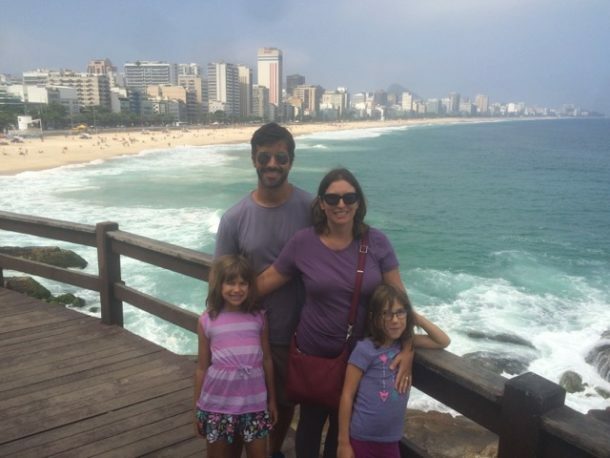 My girls were 8 and 10 when we went, and my younger one likes roller coasters, but she made the mistake of going on an advanced thrill ride first, so actually didn’t end up going on any coasters. The girls are too old for the rides in Planet Snoopy, but they did enjoy Celebration Swings, and my eldest liked Carousel Columbia, a double-decker carousel and Delta Flyer/Eagle’s Flight, a gondola that takes you from one end of the park to another (it has a different name depending on what end you board). The Great America app does not provide wait times for all rides, so we ended up waiting about 20 minutes to get on Delta Flyer. It then broke down and we had to wait longer. We also found out that you couldn’t ride all the way around unless you had a boarding pass from Guest Services. I realized after the fact that boarding passes are for those who are disabled and cannot stand in line that long. Although we didn’t go on many of the rides, I did check the Great America app for wait times, and as expected, the most popular roller coasters had the longest wait times. We spent most of our time at Great America’s Boomerang Bay Waterpark. Luckily, we were able to get a table in the shade for my mother-in-law to sit at. There were plenty of lounge chairs available when we first got there, but as the day went on, they were all taken. Boomerang Bay has a nice mix of waterslides, water areas for younger kids, and water areas for older kids and adults. There are about 5 waterslides and tube rides, a wave pool, a lazy river, a lagoon (shallow wading pool), an area for younger kids that includes waterslides and other features, and a splash area for little ones. Rides that require tubes are provided for free, but you can also rent a tube to use in the wave pool, which we did. The girls could also use their tube in the lazy river, so they didn’t have to wait for one to become available. One thing you should know is there are not a lot of food options in Boomerang Bay. Our table was next to Subway, which was convenient, but we had to wait a long time in the main Canteen area to get chicken tenders. If you want kids meals, you have to go to Planet Snoopy. Ice-tea was the the only non-soda / non-alcoholic drink available in Boomerang Bay. Tip: Bring a reusable water bottle with you as you can refill it with ice and water at any of the Coca-cola stations for free. You save money and prevent more plastic water bottles from ending up in landfills and oceans. There are five entertainment areas located throughout the park. Check Great America’s Shows page for information on current shows and show times. We caught a bit of the R&B boys in the 50s Gazebo. They were quite good. We also caught a bit of the Mardi Gras Party Band, but they weren’t as good. Both groups seemed to be singing current songs, and not songs related to their theme. 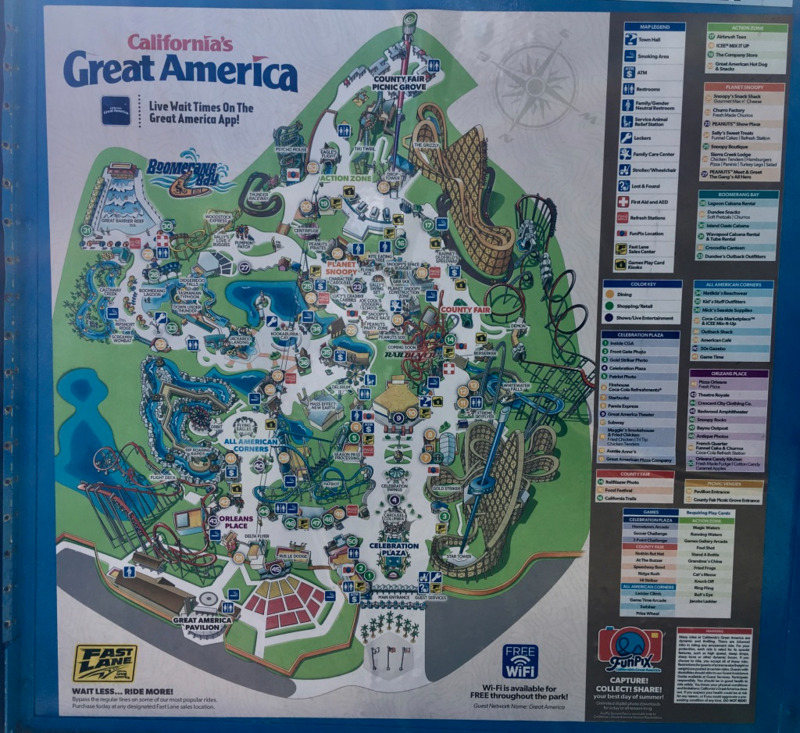 We have been to a number of amusement parks and water parks and found that Great America was a good size with a nice mix of options for different age groups. For example, we found Waterworld needed a greater variety of things to do. Six Flags Discovery Kingdom has rides and animals, but not the water features, and Disneyland can be too big and busy. Like Six Flags, Great America could be more family-friendly by allowing outside food. This is particularly important if you have a picky eater or want to eat more healthy. I also think that FastLane is overvalued, particularly when you consider that Disneyland includes its FastPass in the ticket price. It’s not as big of a deal if your kids are younger, since FastLane is for the most thrilling rides. We spent a good 7 hours at Great America and all of us had an enjoyable day, including my mother-in-law. 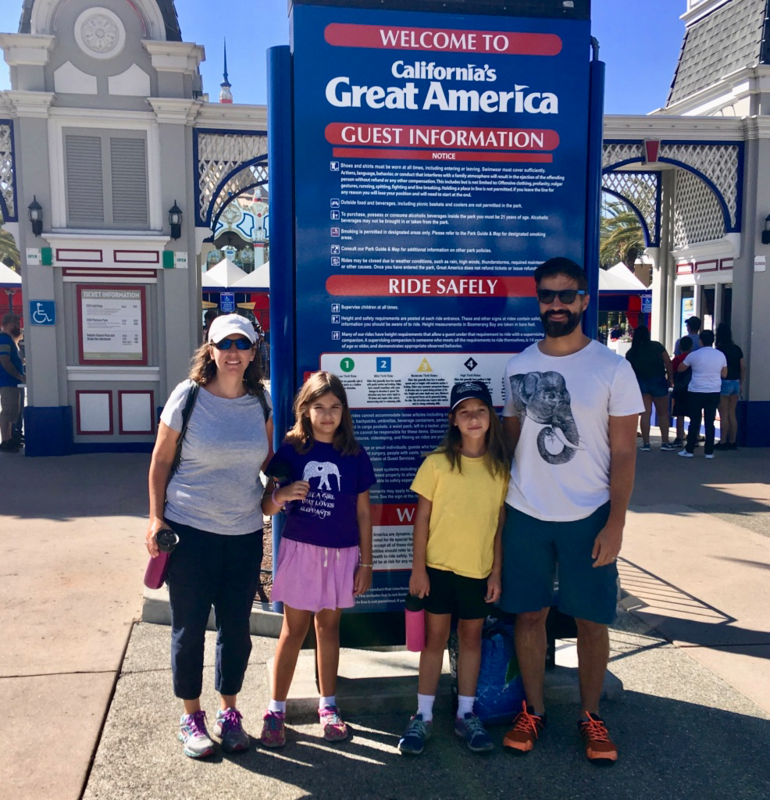 I definitely recommend Great America as a fun family day out!